Handcrafted Erzgebirge wood Nutcracker Bavarian - made in Germany 7,8"
This fantastic NUTCRACKER is made of wood and vividly painted. Makes a lovely CHRISTMAS DECORATION. The Original Nutcracker Made Of Wood Size - Size - 50cm. Stands on a wooden plinth and although has moving "nutcracking" mouth this is for decorative purposes only. A Wooden Nutcracker Hand Painted Soldier - 9" Tall - Incomplete - MISSING HIS STICK /GUN Condition is USED Dispatched with Royal Mail 2nd Class. The nutcracker looks superb on display. 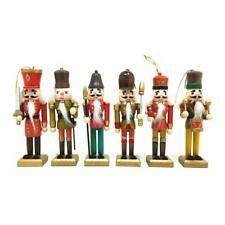 Set of 5 wooden Nutcracker Soldier Christmas tree decorations. work place. We endeavour to answer your queries within 48 working hours. Wherever possible we do try & re-use all our cardboard boxes. Popular Categories. 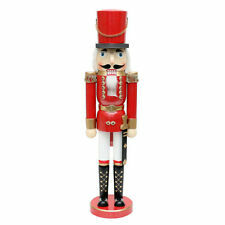 6 X Wooden Nutcracker Soldier. Gorgeous Christmas Nutcracker music box by Gisela Graham. Revolving Christmas tree music box featuring characters and music from the Nutcracker story. Pull the cord down for his arms & legs to move. 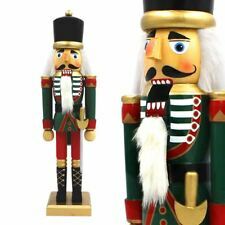 Christmas Nutcracker Soldier LIFESIZE 6FT TALL! Mint condition. This fine Christmas piece looks absolutley stunning in a hallway to greet your guests over the festive season. DO NOT PLAY MUSIC OR LIGHT UP WITH LED. Nutcracker shaped rope light. 1.5m LED Nutcracker Rope Light. This festive fellow is sure to really bring Christmas to life in any indoor or outdoor space and is perfect for use year after year! Multi-coloured LED rope light. A really stunning vintage nutcracker soldier . Unusual and a great addition to anyone's collection. Has wear but great condition for its age. Please see pictures as they are part of the descriptive. A really stunning vintage nutcracker soldier . Unusual and a great addition to anyone's collection. Has wear including something missing from his right hand ,and some scratches but great condition for its age. Please see pictures as they are part of the descriptive. White Toy Soldier With Trumpet 6ft Model. Suitable for indoor or outdoor use. Amazingly realistic with high quality finish and detail. Weight: 18 kg. Size: L 120 cm x W 55 cm x H 185 cm. 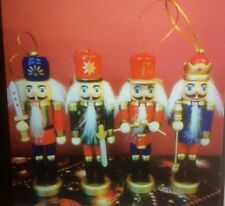 3 ornamental nutcracker soldiers Each one measures 38cms tall Brand new **1 soldier has a tiny green stone missing from his uniform hardly noticable( see photos)** Thanks for looking please view my other items. As all budding Claras know he has other things to do! The Nutcracker Soldier from the famous story and ballet, as sold at the Royal Ballet, English National Ballet, Russian National Ballet, Scottish Ballet, etc. As all budding Claras know he has other things to do! Christian Ulbricht Limited Edition Jack Frost Nutcracker. 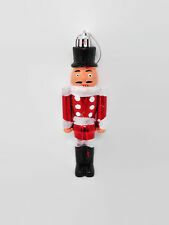 Add a traditional touch to your Christmas with this nutcracker soldier from Gisela Graham. work place. Wherever possible we do try & re-use all our cardboard boxes. Popular Categories. Helpful Links. Traditional Nutcracker Model. Suitable for indoor or outdoor use. F.O.C Collections from NP23 7TJ. Weight: 25kg. Size: L 60 cm x W 46 cm x H 180 cm. 90cm Forester Wooden Traditional Nutcracker Christmas Decoration. 90cm Forester Wooden Traditional Nutcracker. Large 90cm height. Height: 90cm / 36". Helpful Links. Wild Bird Care. Water Features. Water Feature Accessories.